The Digital Research Library of Illinois History Journal™: The O'Leary's, their cow, and the Great Chicago Fire of 1871. 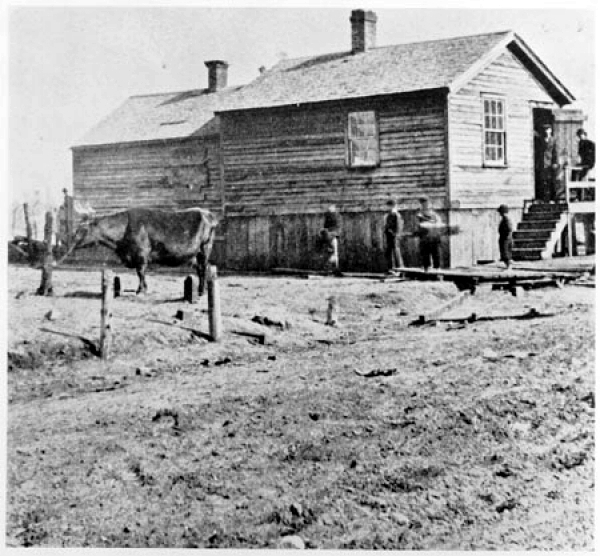 The O'Leary's, their cow, and the Great Chicago Fire of 1871. The summer of 1871 was extremely dry with only about one inch of rain in 4 months. On October 8, 1871, Chicago endured one of the worst urban fires in American history. Maximizing tinder-dry conditions, a gale-force wind turned a small fire into a huge disaster. 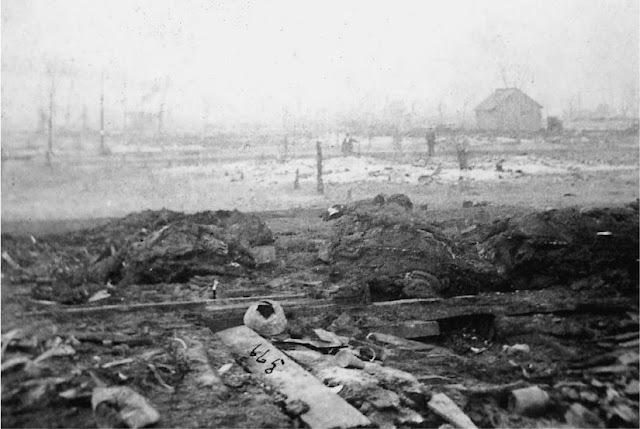 Almost three square miles of the city were destroyed. Nearly 300 people died. The entire business district was wiped out. Chicago had come a long way since Jean-Baptiste Pointe du Sable first settled near Lake Michigan (in the late 18th century) where John Kinzie's house originally built by du Sable. From a small settlement (called Fort Dearborn) to a major transportation center (40 years later), Chicago prospered. 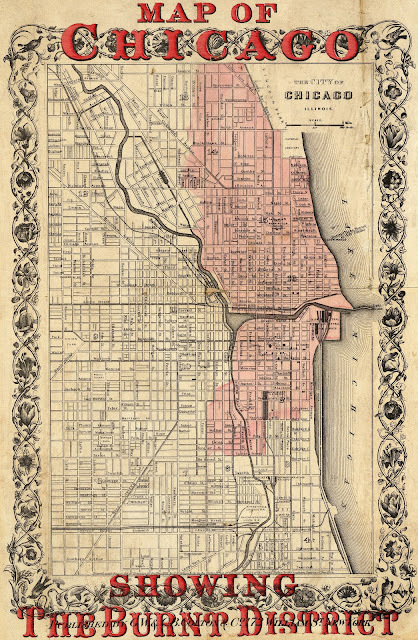 As the Civil War neared its end, Chicago was "the metropolis of the northwest." By 1868, little was stopping the city's growth. 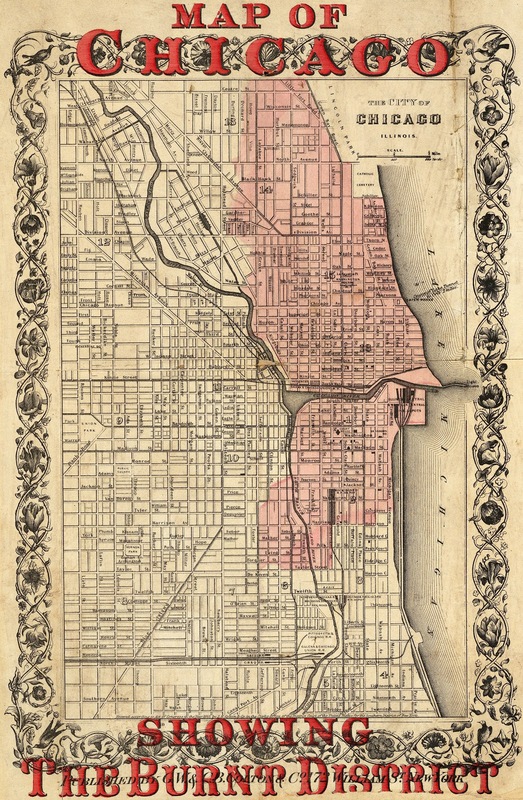 The three branches of the Chicago River formed a kind of boundary for the town. The south branch divided the rural part of south Chicago (where the O'Leary family lived) from the urban part. In 1871, Chicago had over 330,000 inhabitants. Its fire department and equipment were "modern" for the time, but the city employed only 185 fire-fighting personnel. On the night of October 7th the "Saturday Night Fire" broke out at Lull & Holmes Planing Mill at what is now 209 South Canal Street. Some of the city's equipment was damaged while the already overworked, understaffed fire-fighting crews were battling that blaze. The Front of the O'Leary House at 137 DeKoven Street, Chicago, Illinois. Patrick and Catherine O'Leary lived with their five children in the rear of this house at 137 DeKoven Street, Chicago. It's generally acknowledged the fire started in the O'Leary barn but no one is really sure how it started. There is the belief that Mrs. O'Leary's cow kicked over a lit lantern. But there is no proof of this claim. 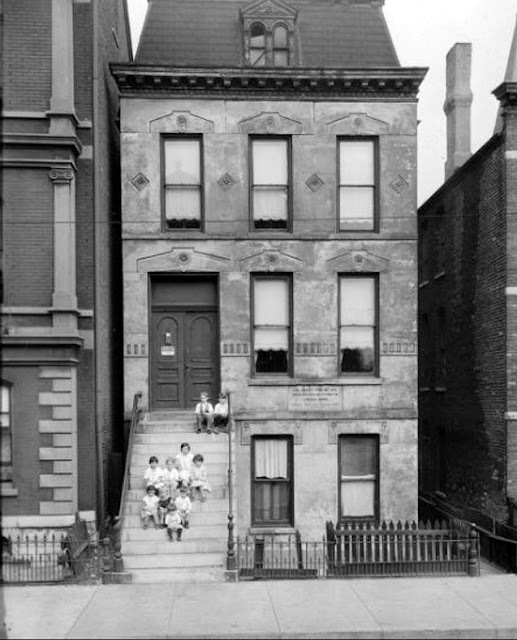 Patrick and Catherine O'Leary lived with their five children in the rear of this house at 137 DeKoven Street (Today: 558 West DeKoven Street), Chicago. They rented out the front two rooms. They owned five cows, nameless, which grazed in the yard. This was common for near-westside Chicago dwellers - like the O'Learys - before the Great Fire of 1871. Owners relied on their living-within-the-city animals for fresh milk and eggs. They would either consume the products themselves or sell them to their neighbors. 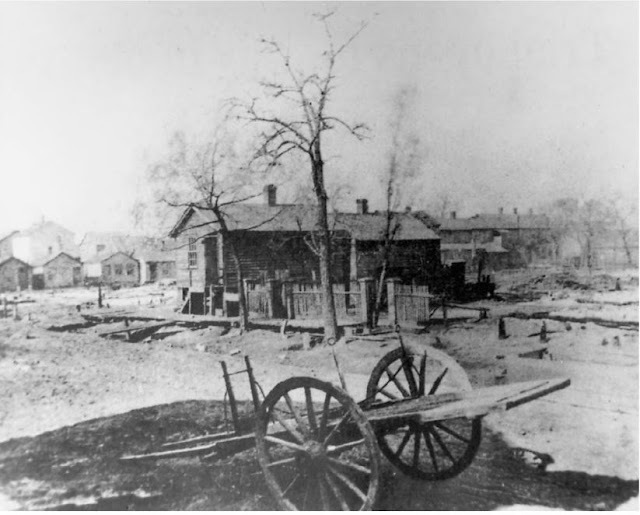 Both the above photographs, circa 1870, depict such a homestead within Chicago's city limits. Daniel ("Peg Leg") Sullivan first saw the flames coming, he said, from the O'Leary barn. Yet, when one considers Sullivan's line of sight to the barn (see illustration), it's doubtful he could even see the O'Leary property. Maybe he really wasn't where he said he was. Along those lines, a recent study blames Sullivan himself. Did he go to the O'Leary barn to feed his mother's cow that night? If so, did he smoke there and inadvertently start the fire? Historians have always considered the drought and an out-of-control brush fire as the likely cause. That was at least part of the official findings after the investigation was concluded. Ironically, the O'Leary's house located at 137 DeKoven Street was spared from the fire. Southeastern view of the O'Leary house. 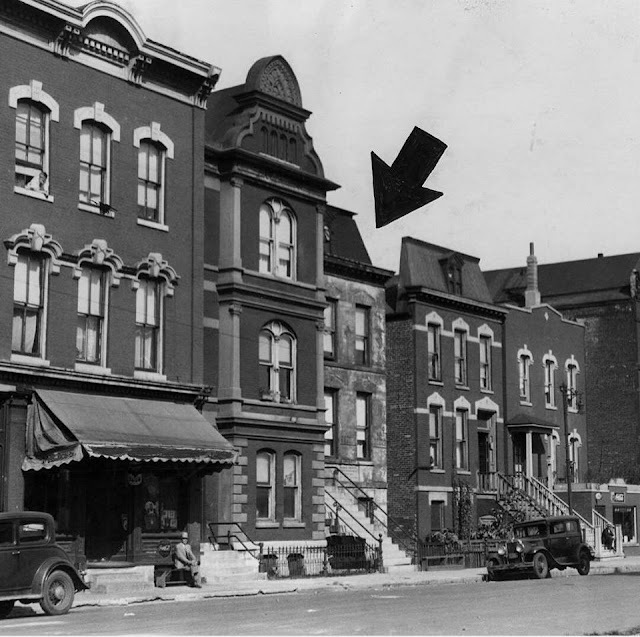 In the center of the block stands a small one-story tenement. On every side are ashes and cinders. Not a house of shed remains west, south or north of it, and a half a dozen ash piles tell the passer-by where stood houses on the east of the solitary shanty. It is past explanation that all the rest went and that remained. 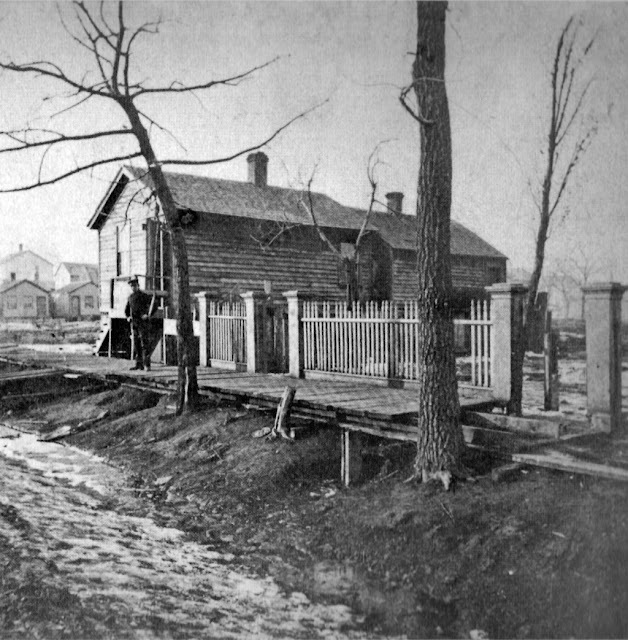 Looking north from the back of the O'Leary house towards Taylor Street. The debris in the forefront is all that remains of the famous barn. Whatever the cause, a combination of failures worked against Chicago that night. An elaborate fire alarm system - dependent on human input - failed. 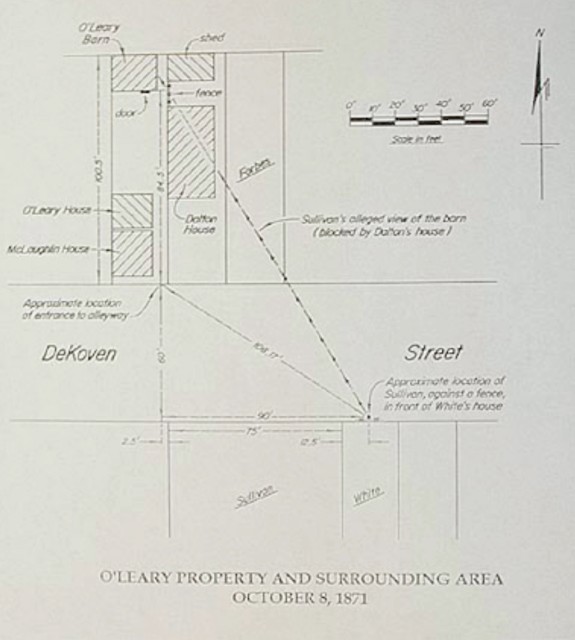 The alarm closest to the O'Leary farm (Box 295) was never rung. Firefighters in the vicinity of DeKoven Street learned about the fire when they saw it. All available men and equipment were fighting a losing battle on the south side. No one dreamed the fire would jump the river. When it did, no one was there to combat the growing wall of flames. People were awakened by the fire. Many left their homes with shawls and blankets around them. People fleeing certain death spent the night among the cemetery dead - at Potter's Field, near Lincoln Park - close to the Lake Michigan shore. The Chicago Tribune was burned out of its building. Citizens, in a panic, tried to flee over the Randolph Street Bridge. There was a heartbreaking loss of life as entire families were unable to escape. A hundred thousand people who had enjoyed an unseasonably warm and beautiful Sunday were homeless by Sunday night. Mary Todd Lincoln (widow of President Lincoln) was residing at her son Robert Lincoln's house on Wabash when the Chicago Fire started. Read what happened. Fleeing people thought they'd be safe in Lake Michigan. They weren't. Some never came out of the water. The intense heat from the burning buildings, even the flames from them, reached the water, and even stretched out over it. The fleeing men, women, and children, rushed into the lake till nothing but their heads appeared above the surface of the waters; but the fiery fiend was not satisfied. The hair was burned off the heads of many, while some never came out of the water alive. Many who stayed on the shore, where the space between the fire and water was a little wider, had the clothes burned from off their backs. Recently the idea of a disintegrating comet, with falling meteorite debris, has resurfaced as a possible cause. (a 58.5 pound meteorite allegedly found on the shore of Lake Huron.) At the time of the fire, people said they saw burning material falling from the heavens. No one took them seriously, of course. They were just hysterical people, weren't they? Yet the line of actual fires, drawn from the meteorite's Lake Huron location to Peshtigo, Wisconsin and Chicago, Illinois, makes one wonder about the evidence. Or was it just a coincidence? 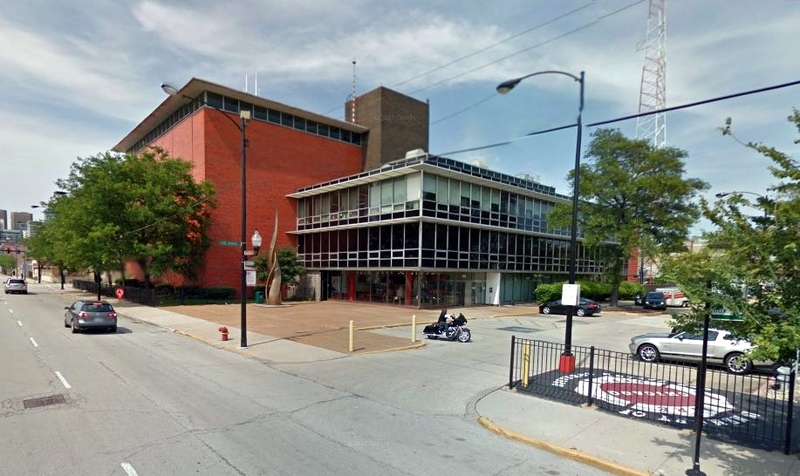 The Chicago Police and Fire Academy now occupies the spot at 558 W. DeKoven Street (was 137 DeKoven Street) at the corner of South Jefferson Street, Chicago. Mrs. Catherine O'Leary and the cow were exonerated (but not Mr. Patrick O'Leary) from starting the 1871 Chicago Fire in an official City Council Resolution on September 10, 1997. St. Michael's Church, Old Town, Chicago. False Claims of Other Buildings that Survived. Even though Old St. Patrick’s Church at 700 W Adams Street, Chicago, website claims to be a survivor of the 1871 Chicago Fire, they were not in the burn district. The Church was a few blocks farther west than the fire reached. They also claim to be the oldest public building in the City of Chicago, but the church is not owned by the city of Chicago. (Click the 'burnt district' link in the story). St. James Cathedral at 65 E Huron St., Chicago was totally gutted when the Great Chicago Fire erupted. There was nothing left but the stone walls, the Civil War Memorial, and the bell tower, whose bells rang for as long as possible, gave warning to the neighborhood of the encroaching fire. Mary Todd Lincoln - In the midst of the Great Chicago Fire of 1871. The "Saturday Night Fire" struck Chicago on Saturday, October 7, 1871. The Great Chicago Fire of 1871 - "YOU ARE THERE"
The Great Chicago Fire of 1871 - "YOU ARE THERE." This film, narrated by Walter Cronkite, takes you through the Great Chicago Fire as if it was a TV news broadcast. A wonderful way to "experience" what it might have looked like through the television camera and perhaps what it could have been like to live through the Great Chicago Fire. All very interesting. We'll probably never know what really started the fire. That cow is a legend though! The story about the cow kicking over the lantern was created by a newspaper columnist. Fasinating article...still seems the cow kicked over the lantern story is more feasable to what I've learned.